This is the world’s most boring picture of one of the nicest chickens I’ve had in a very long time. I didn’t tell Stephen what we were having but instead had hime go and smell the dish. His reaction was “Hey! This is Swiss Chalet chicken”. It is so true. I honestly didn’t think that this recipe was going to work but it even created a chalet style sauce in the pot. This will be on my list of things to make when I go back to work. It took about thirty seconds to throw in the pot and then looked after itself. Don’t forget to start your meat off from frozen to have a terrifically moist bird. I put the dish on high from the beginning and it cooked for 6.5 hours. Stir together flour, cornmeal, sugar, baking powder, salt, and ground ginger in a large mixing bowl to combine, and break up any lumps. Mix half-and-half and melted butter together in a small bowl until evenly combined. Pour half-and-half mixture over flour mixture and stir until just combined (dough will resemble a cornbread batter). Set aside. In another large bowl, gently fold nectarines, blueberries, sugar, and lemon juice together then transfer to a large straight-sided skillet. Cook over medium heat, stirring occasionally, until fruit starts to release some of its juice, about 6 minutes. 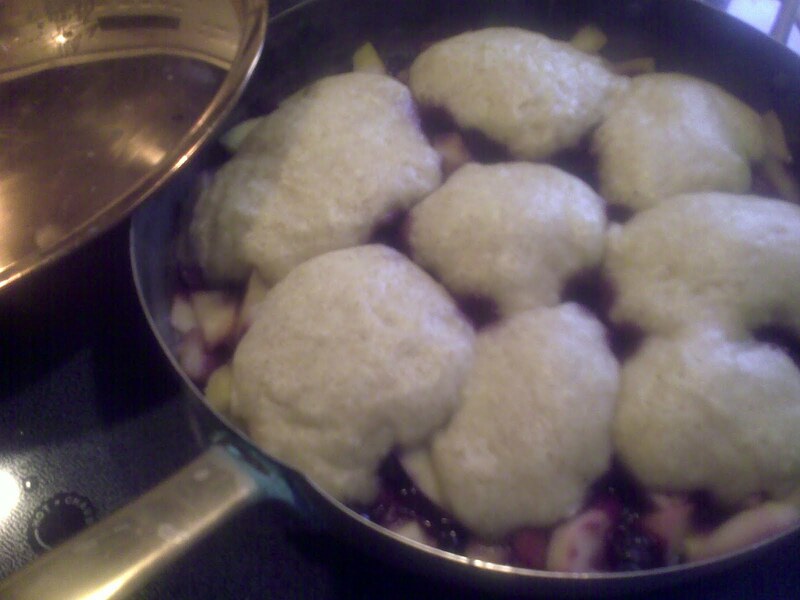 Drop eight large dollops of batter over fruit mixture and reduce heat to medium low. Simmer, covered, until dumplings are cooked through and juices are bubbling, about 20 to 30 minutes. Remove the lid and continue cooking until dumplings are springy to the touch and no longer sticky, about 5 minutes more. Serve warm, drizzled with heavy cream. 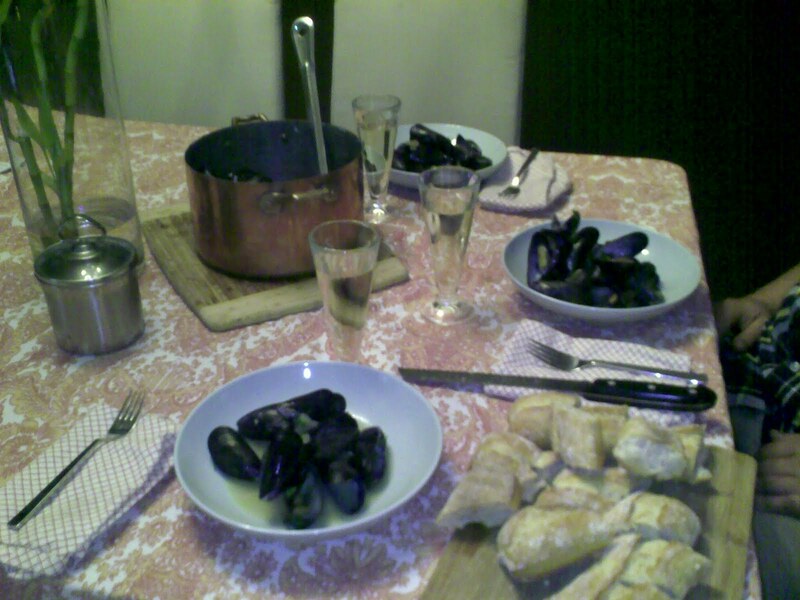 Here is the table with my gorgeous copper pot full of mussells. The unattractive chocolate loaf in all its glory. The spelt flour let the cake have a nice nutty flavour and the brown sugar made a great crust on the top. Back to 100% humidity and I’m torn between turning the air conditioner on or bbq’ing. 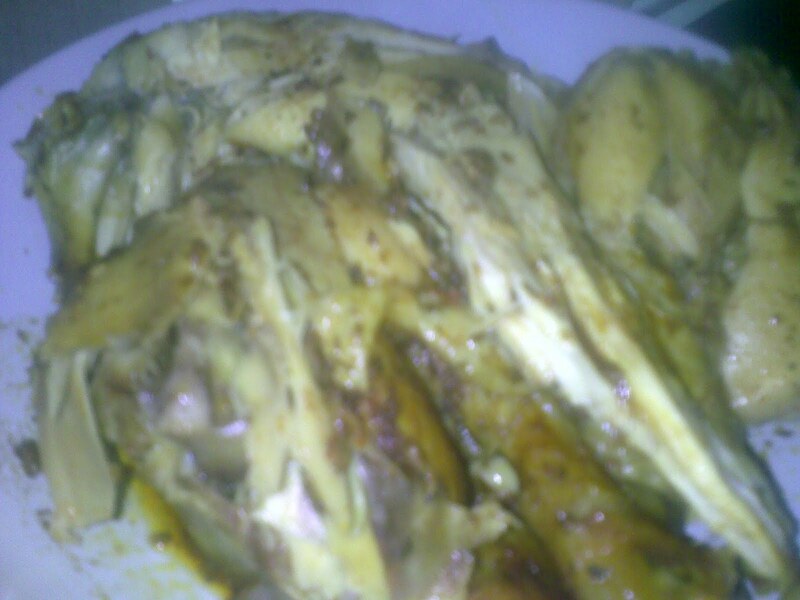 We’ll be having chicken tonight regardless as I need some to make a batch of food for the bobo. Skin the chicken and get rid of the neck and other stuff from the cavity. This takes a while, and is gross. Keep small children away so you don’t freak out about salmonella. I skin whole chickens because I hate the idea of the chicken fat simmering all day in the crock—it also looks disgusting when the chicken is cooked because it’s all slimy and icky. I get it that I’m weird. If chicken skin makes you happy, then by all means, ignore me. 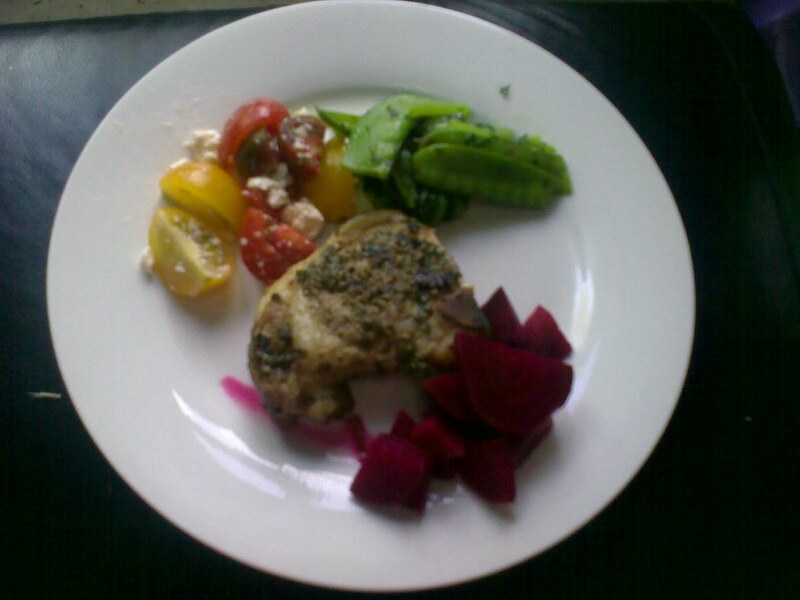 We paired the lamb with beets, tomatoes and feta and greens. Beets: Boil the beets with a star anise and a couple of cloves until just tender and then cool under the tap. I don’t bother to peel the beets this time of year as the skins are so thin. Slice the beets into 1/4 inch chunks and place in a bowl of vinegar, honey and cloves. Let sit for however long you have. Greens: Steam the greens and pea pods in a bit of salted water until just tender. Drain off any water and stirfry with a bit of butter. At the last second toss in a small handful of freshly chopped mint. Dessert was cheesecake. I made it the same way as the mojita cheesecake but used crushed lady fingers as the base and instead of mint in the mix I added a bit of orange essence and some blackberries (about 1 cup) that were mashed roughly with a fork and drained of some of their juice. YUMMMMM…thank goodness we have neighbours who took the rest of this dessert or I would have been in the middle of the night finishing it off. We take Peter to the airport for 7:00 tonight and I want him to have something with lots of protein but still be light. A bit bowl of mussells is going to fit the bill. I tried to talk everyone into trying the mussells in a coconut and lemongrass broth but I’ve been over-ruled and we’re going for our usual white wine sauce. For dessert though I have a special treat. I’m making ugly chocolate cake. This is another recipe from Heidi over at 101cookbooks. 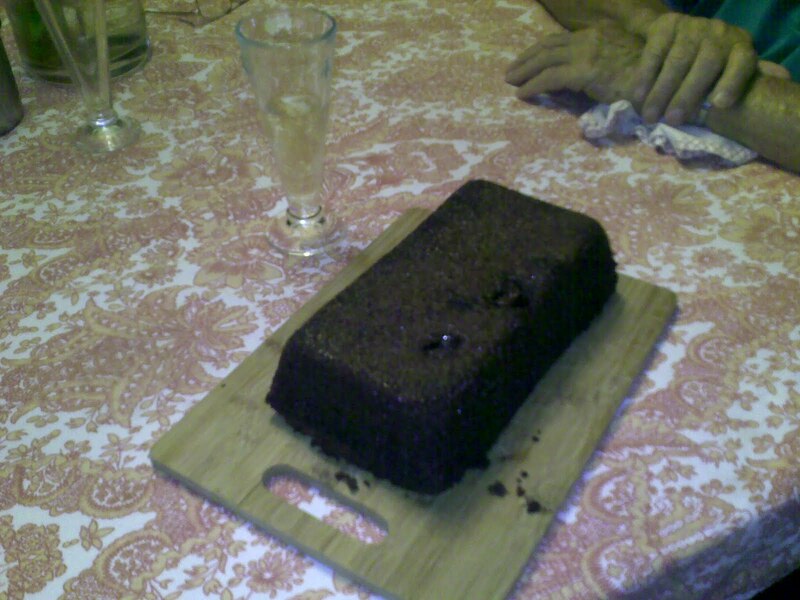 She based this recipe on Nigella Lawson’s chocolate loaf cake from “How to be a domestic goddess”. I’ve made that recipe quite a few times and so I was anxious to try Heidi’s take on it. Accept that this cake will fall in the middle and not look pretty. It just does. It’s not you. This cake makes up for its appearance with a big taste. I hope this is as good as Nigella’s who really is my eating icon. Preheat oven to 375F / 190C with a rack in the center. Butter a 9×5-inch (23 x 13-cm) loaf pan and line with parchment paper. You have to line the pan if you ever want to get this cake out of it. Sprinkle with the lemon zest and set aside.